Over sixteen hundred Scientologists and guests from throughout the western United States and Canada packed the street in front of 300 West Harrison in Seattle, for the dedication of the new Church of Scientology of Washington. Duwamish Tribal Chairman Cecile Hansen, descendant of Chief Seattle after whom the city was named, and other First People of the Northwest, performed a centuries-old traditional ceremony welcoming the Church of Scientology of Washington to its new home in Seattle’s Queen Anne neighborhood. The dedication ceremony for the new Church of Scientology of Washington opened with a centuries-old Native American ceremony. Addressing those in attendance, Washington State Representative Maralyn Chase welcomed the new Church of Scientology, presenting an official message from Washington Governor Christine Gregoire congratulating the Church and its parishioners on this important milestone. Mr. David Miscavige cut the ribbon opening the new Church of Scientology of Washington, accompanied by government and community leaders and Scientology parishioners who spearheaded the building of the new Church. Over sixteen hundred Scientologists and their guests attended the grand opening of the new Church of Scientology of Washington in Seattle's Queen Anne neighborhood. Mr. David Miscavige, Chairman of the Board of Religious Technology Center and ecclesiastical leader of the Scientology religion, cut the ribbon on the new Church in the Emerald City. After the ribbon fell, Scientologists and guests streamed into the 34,500-square-foot brick and glass structure at 300 West Harrison, to tour the new Church of Scientology of Washington in Queen Anne. 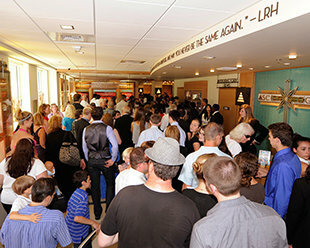 With the ribbon cut, Scientologists and guests entered the new Church of Scientology of Washington, to tour its extensive Public Information Center, Chapel, and further rooms and spaces. Scientologists and guests toured the Public Information Center of the new Church, including multimedia displays presenting and illustrating the beliefs of Scientology, the life of its Founder L. Ron Hubbard, and the Church's many social betterment and community outreach programs. The new 34,500-square-foot brick and glass structure of the Church of Scientology of Washington has been fully renovated and reconfigured for service to parishioners and the entire community. The building's five stories features a Chapel, a library containing all Church Scripture, and a multitude of seminar rooms, film rooms and volunteer work spaces, in addition to course rooms and counseling rooms for parishioners. The reception of the new Church of Scientology of Washington, leading directly to the Chapel and the Public Information Center, which features an extensive array of multimedia displays. A series of state-of-the-art multimedia displays in the Church's Public Information Center provide a concise but panoramic view of the religion to visitors, students and others desiring to learn more about Scientology. The Information Center is open for viewing seven days a week. The Chapel of the new Church of Scientology of Washington State serves parishioners and guests for Sunday Services, Weddings, Naming Ceremonies and other congregational gatherings. In tribute to L. Ron Hubbard’s legacy, every Church of Scientology maintains an office in his honor. The office stands as a sign of respect for Mr. Hubbard and in representation that the Church remains true to his teachings. To make its services even more accessible to the community, the Church has also established a Scientology Life Improvement Center adjacent to the century-old Pike Place Market Historic District. Providing introductory Scientology courses, the Center stands just a short walk from the Space Needle and other city landmarks. On July 24, 2010, over sixteen hundred Scientologists and their guests packed the street in front of 300 West Harrison in Seattle for the opening of the new Church of Scientology of Washington, a milestone for the congregation formed 54 years ago. Mr. David Miscavige, ecclesiastical leader of the Scientology religion and Chairman of the Board of Religious Technology Center, dedicated the new Church of Scientology of Washington State. 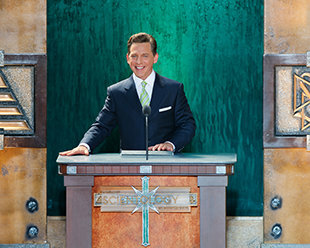 Mr. David Miscavige, Chairman of the Board of Religious Technology Center and ecclesiastical leader of the Scientology religion, officiated, acknowledging the Scientologists who spearheaded the drive to build the new Church. Stressing the significance of the occasion, Mr. Miscavige said: “Just this year alone, we have opened six new Ideal Churches on three continents. While in months to come you’ll see ribbons parting as far away as Tel Aviv, Melbourne and Moscow, and as close to home as Twin Cities, Sacramento and Portland—to cite but a few of the more than 60 new Churches now looming on the near horizon. Acknowledging the Church for its many contributions to the community were Washington State Supreme Court Justice Richard Sanders, Washington State Representative Maralyn Chase, Queen Anne Chamber of Commerce President Dave Peterson, Seattle Neighborhood District Coordinator Christa Dumpys, and FEMA volunteer liaison Jo Ann Oram. 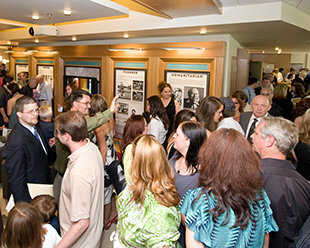 Scientologists and guests toured the Public Information Center of the new Church, including multimedia displays illustrating the beliefs of Scientology and the life of its Founder L. Ron Hubbard. Long active as volunteers in community betterment initiatives, local Scientologists received the Queen Anne Chamber of Commerce Community Service Award in April of 2010. Seattle-area Scientologists serve in the Washington Voluntary Organizations Active in Disaster (VOAD) and as certified associate chaplains of the Seattle Police Department’s Community Chaplaincy Program. The Scientology Environmental Task Force, partnering with the Seattle Parks & Recreation Department, Department of Neighborhoods and Seattle Public Utilities to Keep Seattle Beautiful, sponsors the oldest Adopt-A-Street program in the city. Scientologists have also volunteered with Food Lifeline since 2002 and, since 1993, the Church’s community drug education program has helped thousands of Seattle young people steer clear of substance abuse. Most importantly, it was in neighboring Port Orchard, in 1938, that Mr. Hubbard authored what is remembered as the philosophic foundation of Dianetics and Scientology. A now legendary work entitled “Excalibur,” here was the first examination of key universal principles common to all life forms and underlying all behavior. The new Church of Scientology of Washington is located just blocks from Seattle Center and the Space Needle. The ground floor features an extensive Public Information Center with multimedia displays presenting and illustrating Scientology beliefs, the life and legacy of L. Ron Hubbard and the full array of social betterment and community outreach programs. These interactive displays provide a concise but panoramic view of the religion to visitors, students and others desiring to learn more about Scientology. To even better serve the community, the Church has further established a Scientology Life Improvement Center adjacent to the century-old Pike Place Market Historic District, “The Soul of Seattle.” This center provides Scientology introductory courses. The Church of Scientology of Washington State is the seventh new Scientology Church to open in 2010, while five new Churches are scheduled for completion before the end of the year.